Colonel Gayre and the Order of St Lazarus – St Vincent's Chapel, Edinburgh, the village church in the heart of the city. 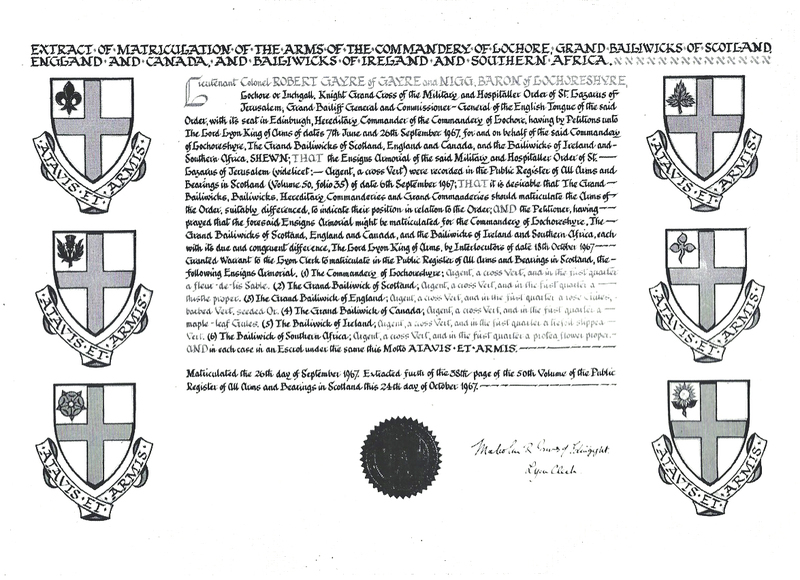 In 1967 Lt.-Colonel Robert Gayre of Gayre and Nigg established a Commandery of the Order of St Lazarus, originally a hospitaller order set up in the Holy Land in the twelfth century. In 1971 he bought St Vincent’s Church. It became its collegiate church, the seat of the Commandery of Lochore. It was the first church to have been acquired by the Order of St Lazarus since the reformation. Whilst it is probable that the church and convent from which the order derived its origins existed some years before, the first written reference to it was made in 1142 – a granting of lands by King Fulk of Jerusalem to the church of St Lazarus (being the patron saint of lepers) and the convent of the sick. The convent and church appear to have been established outside the walls of Jerusalem. Following the fall of Jerusalem in 1187 a move was made to Acre on the Mediterranean coast. From 1198 there was encouragement for knights with leprosy to join the convent (mainly applying to the Templars, the Knights of St John generally looking after their own) though connections with the Knights Templar may have existed from the 1150s. From 1260 it became compulsory for those Knights Templar with leprosy to join the convent. A shortage of manpower in the holy land may well have been one of the reasons for the Lazarites taking on a more military role – though not a very successful one. Whilst the fall of Acre in 1291 to the Islamic armies decimated the order in the Holy Land it had in the preceding years established itself through much of Europe. In England Roger de Mowbray, a participant in the Second Crusade is recorded as having given property to the order around 1157 allowing for a leper hospital to be established at what became Burton Lazars in Leicestershire (Source: David Marcomber The Leper Knights). Not being a wealthy order it was unable to continue with military activity. For a short period in the XVIIth century it manned 10 frigates on behalf of France (Source: James J Algrant A More Measured View of the Order of St Lazarus). It moved first to Cyprus, then Sicily and finally to France, settling on land near Orleans given by Louis VII. Some of the knights settled in Sicily and later Italy and eventually merged with the Order of St Maurice in Savoy which was finally abolished in 1946. Up to the time of the French Revolution, members of the order in France came under the protection of the kings of France. Their numbers were limited to 100 and they were mostly civil servants, diplomats, and nobles. In 1791, following the French revolution, the order was suppressed and its properties confiscated. After the restoration of the monarchy in France, the order appears to have revived and enjoyed some royal protection although it was not fully reinstated nor were its lands restored. However, by 1830 all royal protection had ceased and the order was effectively abolished. It has been argued that the order continued to exist and recruit between 1830 and 1910 but there is little reliable evidence about this period or that this indeed happened. At the behest of the Greek Melchite Patriarch of Jerusalem, the order was revived in 1910 by two members of the Supreme Militia of Jesus Christ, an association that had tried to turn itself into an order of chivalry which was originally formed by a group of former soldiers of the Pope’s army, Tansky (a Polish chaplain) and Watrin (a Frenchman). The history of the order at this period appears somewhat murky since members were alleged to have been associated with others trafficking in fake orders. Following World War I membership increased, though this was initially restricted to French Catholics but later expanded to include Spanish and Portuguese. 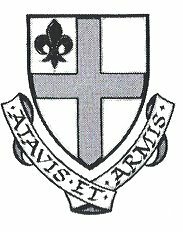 1927 saw the official formation of the “Association of Hospitallers of St Lazarus”, followed by expansion into North and South America. The presidents of Cuba, Dominican Republic and Brazil were amongst Latin American leaders honoured with membership of the order, as was General Franco in Spain. In 1930 Francisco de Bourbon, Duke of Seville, accepted the post of lieutenant general of the order. The first of the revived order’s many splits occurred in the early 1930s. One of the founders of the revived order, Watrin, opposed the introduction of several grades of membership, uniforms and elaborate insignia. He led a faction of traditionalists, but, following his death, this faction declined and had largely died out by the late 1940s. After World War II, the order was again involved with the care and treatment of lepers in Spain, a return to its original function. In 1952 the new Duke of Seville took over from his late father as lieutenant general and, in 1959, became Grand Master. The Duke of Brissac was appointed Administrator General in 1956. The French members complained that the Duke of Seville was not fulfilling his duties because of his military commitments. This led the Duke of Seville to annul the appointment of the Duke of Brissac. In 1967 the French deposed the Duke of Seville and elected the Duke of Nemours (Prince Charles Philip of Orleans, First Prince of the Blood of France) as Grand Master. So at this date, the order was split into Spanish and French factions. In 1961 Colonel Gayre was appointed Bailiff and Commissioner General for the English- speaking world within the order. He took the role on condition that Protestants might be admitted to the order as full members and was very successful in expanding membership. Colonel Gayre established a section of the order known as the Commandery of Lochore which was affiliated to the faction based in France. Colonel Gayre was appointed as the Grand Referendary of the Order by his friend, the Duke of Nemours. However, the French members did not approve of the appointment and the Duke of Brissac deposed the Duke of Nemours to become the head of the French faction (which was later known as the Paris Obedience ). Colonel Gayre then formed a third faction of the English­ speaking members (except those in Canada) known as the Malta Obedience under the leadership of the Duke of Nemours (Gayre had a home and connections on Malta). In 1970 the Duke of Nemours died. His nephew became co­ adjutor, having declined the title of Grand Master, leaving the Malta faction without a Grand Master. Colonel Gayre persuaded the Duke of Seville to take on that title in 1973. This alliance between the Malta Obedience and the Spanish Obedience meant that the factions in the order were reduced to two: the Paris Obedience and the Malta/Spanish Obedience. The Commandery of Lochore was affiliated to the Malta/Spanish Obedience. The Grand Magistracy of the Malta/Spanish Obedience was now in Spain and its administration was in Malta. Following a number of scandals involving officials in Spain, the United States, England and the Commandery of Lochore moved their allegiance to the Paris Obedience in 1985, now under the leadership of the Marquis de Brissac, son of the Duke. Various attempts at uniting the factions in the Order of St Lazarus during this period failed, but they eventually combined under the leadership of the Duke of Seville. Subsequently there have been further splits in the order with the formation of the Grand Priory of England, Wales, Isle of Man and Channel Islands of the Hospitaller Order of St Lazarus of Jerusalem in 1995 by former members of the Paris Obedience. Similar organisations were formed in Scotland, Italy, Malta and elsewhere. These now work under an umbrella organisation known as the United Grand Priories of the Hospitaller Order of St Lazarus. Lt Col Gayre concluded that the people of Gurro most likely could claim Scottish descent, and in 1973 he symbolically adopted them into his own clan. Silvano Dresti recalls an unforgettable party that was thrown to celebrate. “There was a lot of excitement and the whole village was decorated with Scottish and Italian flags for the occasion. Being affiliated to a clan made us proud,” he says.